Featuring the contemporary music of Baltic composers Miškinis, Ešenvalds, and Geilo alongside the established Anglican composers Walton and Bairstow, the album also includes Poulenc’s Lenten masterpiece “Timor et tremor” and three compositions by conductor James Buonemani including the title work written in 2011 for the 100th Anniversary of St. James Church, premiered in May of 2012. 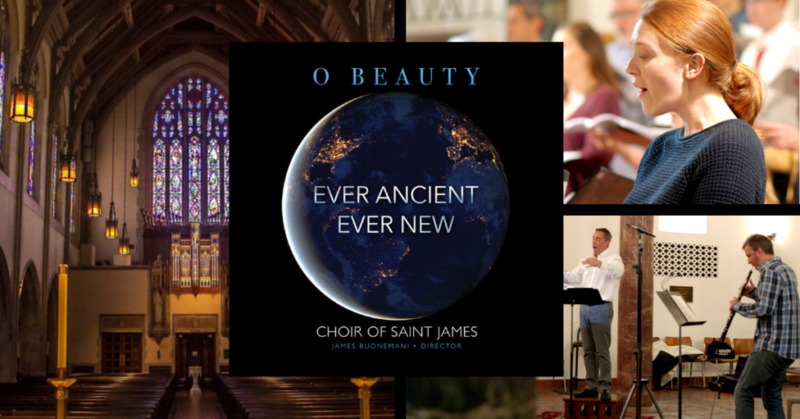 Anchoring this mostly contemporary selection of music is the profound “Salve Regina” by the 16th century Spanish composer Cristóbal de Morales. Humans have always celebrated the cycle of life, where death is the gateway to birth, and birth to death, in ritual and song – a retelling of ancient stories in new and immediate ways. These are the ineffable mysteries of Christianity, and indeed, of all life: a Beauty Ever Ancient Ever New. The CD is available at https://stjla.org/album and at your favorite music retailer.